The Washington Contractor Agreement is used between an Agency and a Contractor who is hired for a particular job/service/task as mentioned in the Agreement. This template can be modified according to your own requirements and then amended to be in effect. Names of both the agency was hiding the contractor and the contractor himself. The details of the contract that need to be mentioned in this agreement which are the contractor’s name, contractor’s address, email address of the contractor, the contact number of the contract. You will need to provide a detailed description of the work that is to be done by the contractor in the purpose section of this agreement. The agency will have to set the period of performance i.e. the start date and the end date of this contract. Both the parties will have to agree on a fixed compensation/payment that is to be paid to the contractor by the agency after the work is finished. Any expenses incurred by the contractor related to the services provided by the contractor will have to be reimbursed by the agency, both the parties have to agree on a maximum limit on the expenses amount. The contractor will have two submit properly completed invoices to the agency every month for him to be eligible for his payment. When making invoices for the expenses the contractor will have two give a receipt for any single expense that is more than $ 50. Both parties will appoint a contract managers who will be the contact person for all communications between the parties. This contract must have the names, the addresses and contact numbers both contract managers. The contractor will have two provided insurance coverage to protect against any claims, suits, actions, costs, damages or expenses arising from any negligent or intentional act or omission from the side of the contractor while performing under the terms of this contract. After both the parties have agreed on all the terms set forth in this Washington contractor agreement the contractor will have to submit a signed copy of this agreement to the agency within 15 days of the effective date set forth in this contract. The latter half of this contract contains exhibit A which has detailed definitions of all the terms used throughout this contract. Along with the terms and conditions related to assignment of this contract, changes in status and modifications, any conflict of interest, disputes and their solutions, indemnification et cetera. 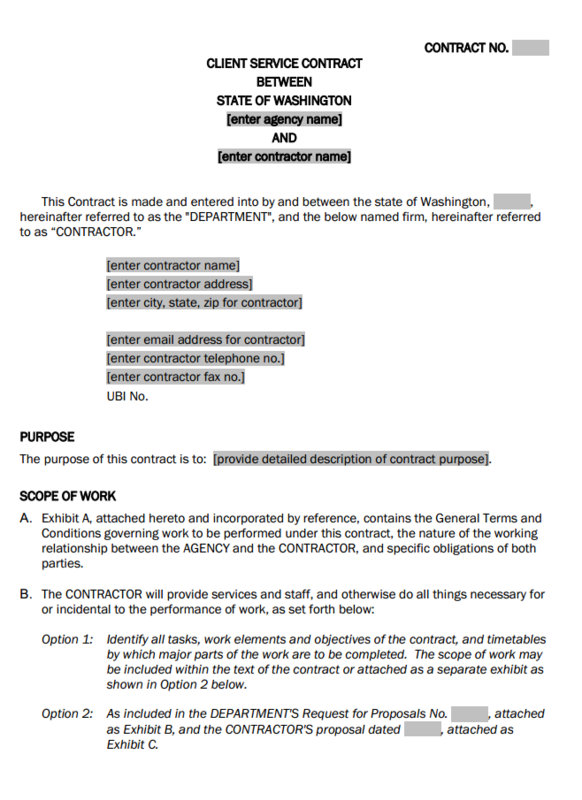 This Washington contractor agreement template can easily be downloaded by clicking on the link at the bottom of this page.